At one end of the house, I have a Sony PS3 that can stream videos from my PC connected to a TV that can also play Divx and Xvid files from a USB drive. At the other end of the house, I have just a standard TV and a DVD player. Of course, since I can’t do something in one place, that’s where I want to do it. So, the task was to come up with a way to play .avi files on a standard TV with a DVD player. I have a Wii connected to that TV so I can use Netflix Streaming and I’ve had Orb setup to stream before but it would slow my PC down to a crawl too frequently. I could hook a laptop up and I’ve even looked at the ASUS EeeKeyboard as a possible solution but those seemed either too much of a hassle or too expensive. That brought me to the cheap and wire-free solution of converting the video files to DVD format that I could just burn to disc. The proposed applications for that approach came in the form of Avi2Dvd or DVD Flick. Avi2Dvd sounds like it would do exactly what I needed done and it even calls itself “an All In One tool in order to convert with just few clicks an Avi/Ogm/Mkv/Mp4/Wmv/Dvd to Dvd/Svcd/Vcd”. Great! The freeware utility is Windows Vista and 7 compatible and comes in a 35 MB download. Inside of that installer are several related free filters and tools including: Avisynth, AC3 filter, CoreAAC, MatroskaSplitter, FFdshow, and Xvid. Sequential installers for each tool load one after another which makes for a lot of clicking and an annoying first impression. Once you get the software installed, you can load your video file and create a job for the conversion process. You may have to do some renaming of your video files as there cannot be any non-alphanumeric characters in file names. Within the job, you need to set the video input, the audio stream, the output, how it’s encoded, subtitles (if any), and create the DVD disc menu. 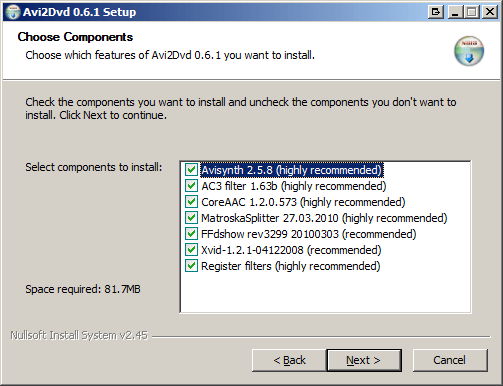 The different tools that were installed with Avi2Dvd are used to make these different processes easier. 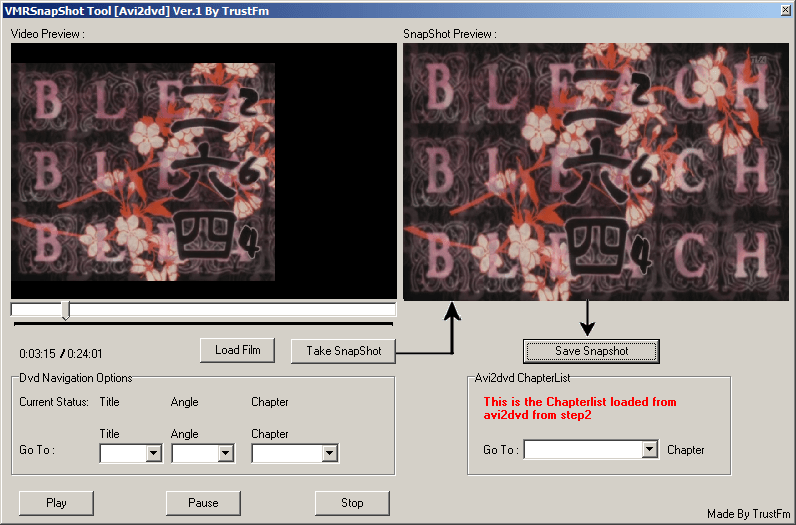 For example, one tool allows you to take snapshots and save them for the title images or the background of the DVD menu. Another tool allows you to convert a .mp3 audio file into a .mp2 for disc menu background music. Creating your own DVD disc menu is simple enough with the tools provided but they don’t seem to turn out that great looking at the hands of the novice. There are a number of tutorials out there that explain the process but it still seemed a rather complicated one at that. DVD Flick has actually been installed on my machine for a few months. I had previously used it to burn some YouTube videos (ripped using TubeMaster++) to DVD on another computer running Windows XP. I would have reviewed it sooner but for some reason it had problems running on my Windows Server 2008 computer. After Avi2Dvd didn’t really pan out for my particular needs, I decided to try DVD Flick again. Without changing anything, DVD Flick worked flawlessly today (though it still makes me think of this Fail Blog entry). DVD Flick is only a 13MB download with a single installer and has a much better interface. Instead of being a compilation of tools to complete a few related tasks, it’s a single tool to gracefully complete a single task. You work within configurable Projects, add video files, change the title’s order, and create a disc menu. All of which seemed very intuitive and straight-forward. 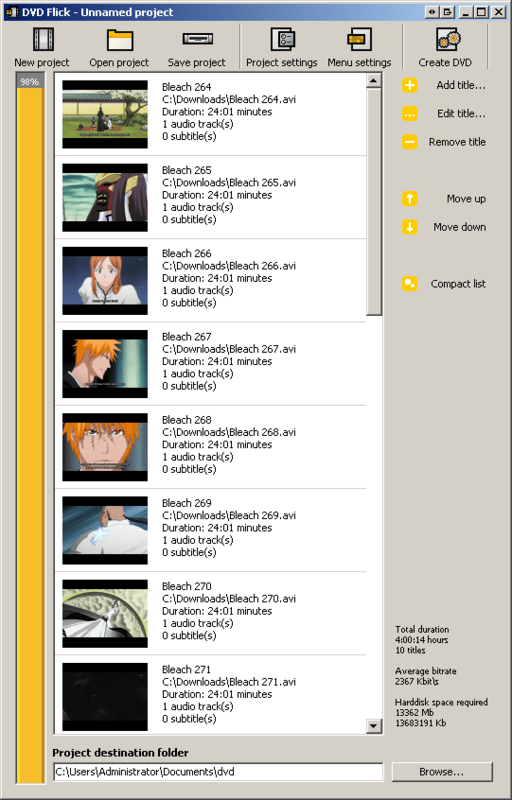 You can add multiple video files at a time and they’re added immediately to a list, showing screen grabs from each episode. The menu customization tool allows you select from a few different templates. The top line will be your project name, which you configured under the Project Settings button. The Play/Resume entry starts playing the first title and then working its way through. The Select Title entry allows you to choose which video file you want to watch currently. 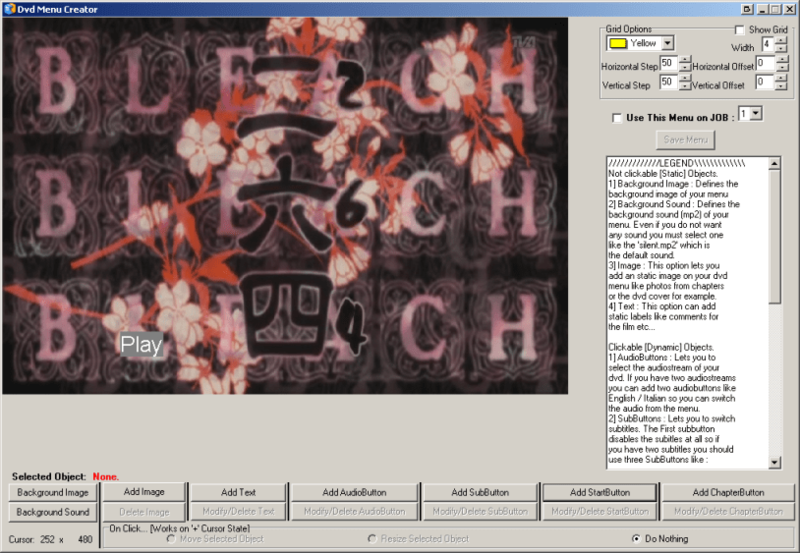 The title menu is generated automatically using the same theme but showing the different episodes in the order you specified in DVD Flick. By default the project will be encoded and compiled into DVD files (the VIDEO_TS and AUDIO_TS directory structure) but you can also set in the Project Settings to create an .iso image or burn to disc. After taking about an hour and 40 minutes to encode the 10 different video files, it burnt the DVD with ImgBurn. Though the conversion process took a while, I was getting great frames per second and the end result was simple, cheap, and high quality. Though the time required will take some forethought, the whole task was simple and largely done unattended. Now I’m able to watch the shows I downloaded in the other room with no additional hassle or expense so if you would like to convert .avi files (or 45 other file formats) to a DVD format, there’s nothing easier nor with a slicker interface than DVD Flick.